The purpose of the 2018 We Are Donor Conceived survey was to gain meaningful insight into the thoughts, feelings, and experiences of donor-conceived adults— i.e. individuals conceived via sperm and/or egg donation. The survey was open to responses between April 4th and May 30th, 2018. To garner as many responses from donor-conceived adults as possible, it was shared on two Facebook groups for donor-conceived people: We Are Donor Conceived (373 members) and the Worldwide Donor Conceived People Network (389 members). A total of 127 donor-conceived people born between 1958 and 2003 participated in the survey. The majority of respondents (69%) were born in the 1980s or 1990s. Respondents were from 11 different countries, including Australia, New Zealand, the UK, France Belgium, Germany, Spain, the Netherlands, and Iceland. The majority were from the United States (94) and Canada (11). Most respondents (83%) were raised by heterosexual parents. Over half (58%) did not grow up with another donor-conceived sibling. Most participants (88%) were female. Though the survey was open to individuals conceived via donor egg, sperm, or both, 98% of respondents indicated they were conceived via donor sperm. The majority of survey respondents (63%) learned about the nature of their conception from their parents, either as a child (26%), teenager (12%), or adult (25%). Just over one-quarter of respondents (26%) discovered this information from a DNA test. Previous research suggests a shift in attitudes towards early disclosure in the 1990s, as more single women and lesbian couples began accessing anonymous sperm donation to conceive a child. Results of the 2018 survey bear this information out. 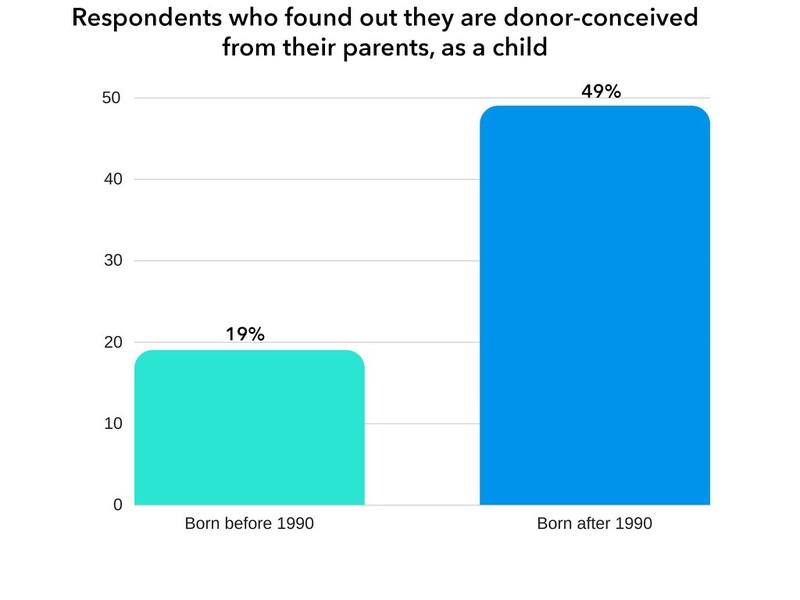 Nearly half of respondents (49%) born after 1990 discovered they are donor-conceived from their parents, as a child, whereas only 19% of those born before 1990 found out the truth this way. 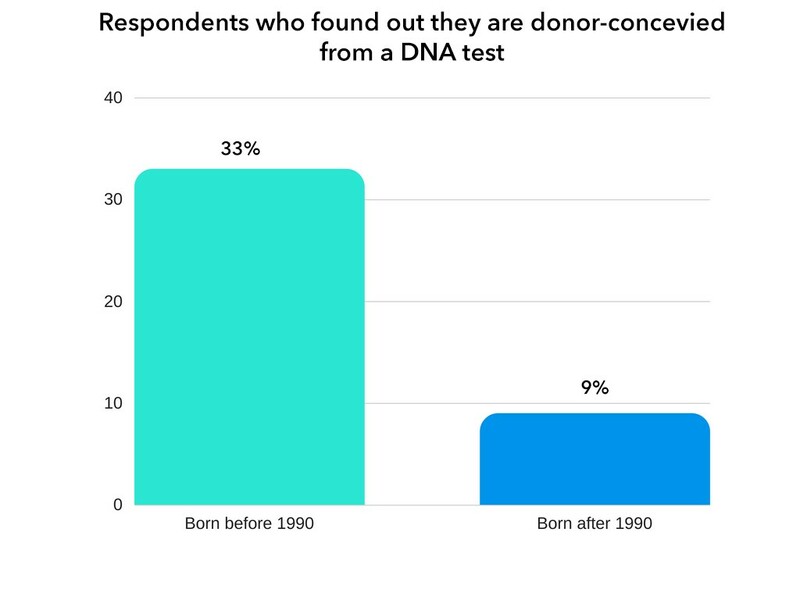 A similar disparity is evident among survey respondents who learned they are donor-conceived from a DNA test. Respondents born before 1990 were more likely than those born after 1990 to have learned the truth about their conception this way (33% vs 9%). DNA testing kits aren’t just revealing the truth about individuals conceived via sperm and egg donation; survey results indicate these kits are also a popular tool for donor-conceived individuals looking to learn more about their origins. Ninety-one percent of survey participants said they have taken a DNA test. 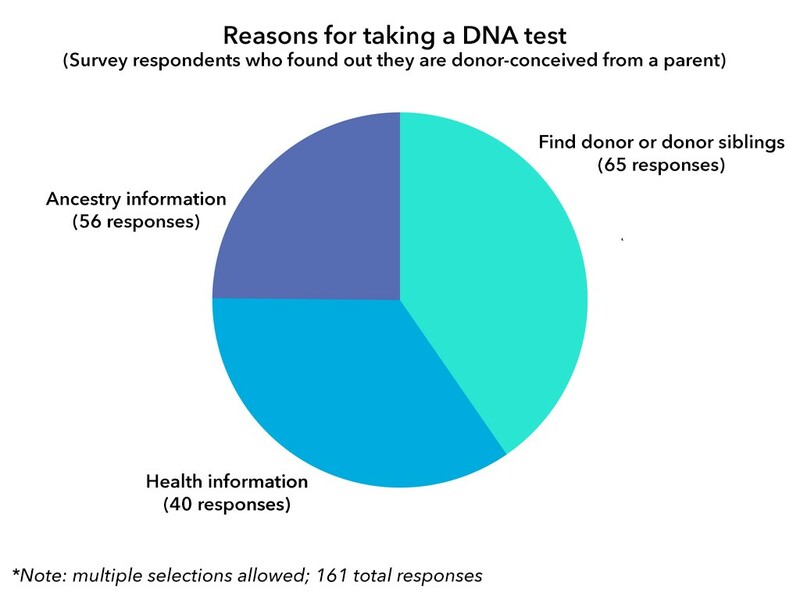 The most commonly cited reason for taking a DNA test among participants who found out about being donor-conceived from their parents was to find family members, i.e. their donor or donor siblings, (cited by 93% of respondents), followed by ancestry information (cited by 79%), and health information (56%). Participants were invited to share their feelings on being a donor-conceived adult. Short answers to this question commonly included words like overwhelmed, intrigued, weary, angry, confused, frustrated, resentful, and fine. Below is a sampling of some of the longer responses. Q: How do you feel about being donor-conceived today? For the sake of brevity, this report primarily uses the word “donor” to denote the person who provided half of a donor-conceived person’s DNA. 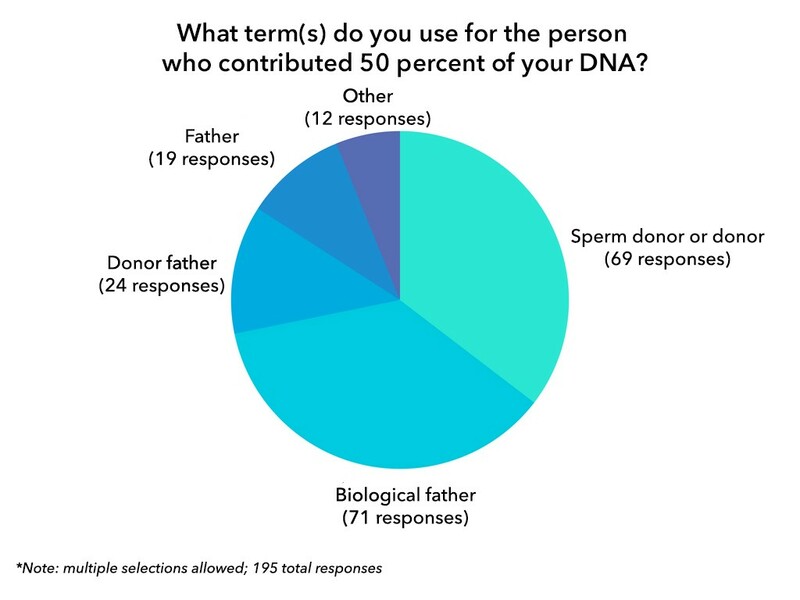 Donor-conceived individuals use a variety of terms to describe this person in relation to themselves, including biological father (cited by 56% of respondents), and sperm donor or donor (cited by 54%). Other terms used include donor father (19%), and father (15%). Among those who selected “other”, commonly cited terms include bio dad, dad, and “his name.” Taken as a whole, the terms that contain the word “father” or “dad” in some form outnumber “sperm donor or donor” (119 vs. 69). Note: multiple selections were allowed for this question. Results also indicate that many respondents use two or more different terms. Most respondents indicated they became interested in knowing more about their donor in their 20s or 30s (61%). Among those who found out the truth as a child, 21% (7 out of 33) were interested in knowing information about their donor in early childhood. Overall, only 3% of participants indicated they are not interested in knowing more about their donor at this time. Almost all respondents (97%) believe it is wrong for parents of donor-conceived children to keep their child’s method of conception a secret from their child. Most respondents (78%) do not support anonymous sperm or egg donation to conceive a child. Only 11% are in favor of using anonymous gamete donation. The use of non-anonymous/identifiable donor eggs or sperm to conceive a child has more support amongst respondents: 55% agree with this practice, while 28% disagree. 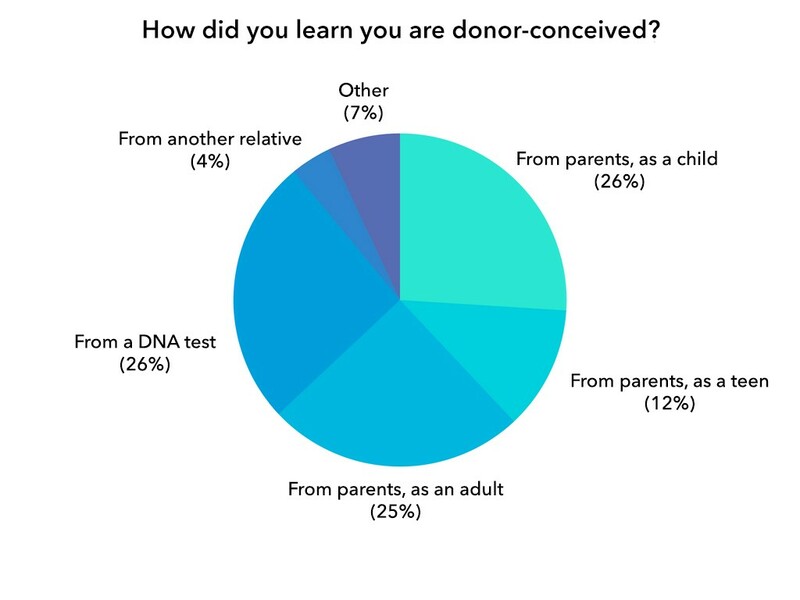 A strong majority of respondents (96%) agree that all donor-conceived people should have the option to learn the identity of their donor and 89% say donor-conceived individuals should have the option to learn the identities of their half siblings born via gamete donation. DNA testing has effectively ended donor anonymity. Results indicate that 57% of respondents have successfully identified their donor through DNA testing and 54% have discovered one or more half siblings this way. The majority of respondents (59%) agreed with the statement “My donor is half of who I am” and 77% agreed that the fact that they are donor-conceived is a significant part of their identity. Common concerns and curiosities among participants including wondering what personality traits, skills, and/or physical similarities they share with their donor (96%); wanting to know more about their ethnic background or family tree (86%); and worrying they do not have a complete and/or accurate family health history (84%). The majority of respondents (59%) also indicated they are worried the mother and/or father who raised them would feel angry, hurt, or threatened if they expressed an interest in learning more about their donor. Survey participants favor limiting the number of offspring a single donor can produce. When asked how many individuals would be appropriate, the highest ranked responses were “fewer than five” (48%) and “6-10” (42%). There is also a strong consensus among respondents that sperm banks/clinics “do not adequately understand or respect the emotional needs of donor-conceived people.” Ninety-one percent of respondents agreed with this statement. 2018 survey results are also embedded below.